Fighting has eased in parts of Syria where a Russian-led initiative to halt the country's six-year war took effect from midnight, activists say. The deal unveiled by Russia on Thursday to set up four "de-escalation zones" is backed by Turkey and Iran. But the main Syrian opposition grouping says it has little faith in the deal. Elsewhere in Syria, activists say government aircraft have hit central Hama province, and there are reports of shelling and gunfire in other parts. The opposition High Negotiations Committee (HNC), said on Friday the safe zones plan lacked "safeguards and compliance mechanisms". It also said it did not accept Iran as a guarantor of the deal. The UN special envoy for Syria, Staffan de Mistura, told the BBC the agreement was important because it was being implemented by three countries who could make it work. The UK-based Syrian Observatory for Human Rights (SOHR) said Syrian fighter jets on Saturday bombed rebel positions in Hama. A rebel commander confirmed that fighting had broken out after midnight, Reuters reports. The Syrian military have so far not commented on the issue. What are the safe zones? The so-called "memorandum on the creation of de-escalation areas" was announced by the Russian military after talks in Kazakhstan's capital Astana. Russia's foreign ministry published the full text of the agreement on Saturday. The objective is to halt attacks by all sides and to "provide the conditions for the safe and voluntary return of refugees" in addition to the speedy provision of relief supplies and medical aid. Syria war: Who's fighting whom? The four zones will remain in place for six months, but their borders have to be finalised by Russia, Iran and Turkey by 4 June. Russian Deputy Defence Minister Alexander Fomin said on Friday that there had been no bombing raids by Russian aviation in the four zones since 1 May. But he stressed that Russia's air force would continue striking militants from the Islamic State (IS) group elsewhere in Syria. The US has expressed concern over Iran, saying the country had "only contributed to the violence, not stopped it". 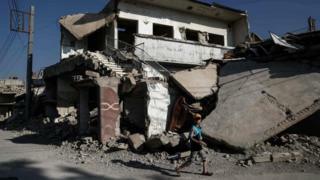 The Syrian government of President Bashar al-Assad is not a signatory, but its state news agency has said it supports the plan. The Astana talks were meant to shore up an oft-violated ceasefire which was originally agreed in December. A partial cessation of hostilities was declared at the end of last year, but violence has continued on several fronts. Syria's war has claimed more than 300,000 lives since it erupted in 2011.